As Prime Minister of Malaysia for 22 years, Tun Dr. Mahathir Mohamad was an extraordinary leader. He had been playing an important role in international political arena for decades. 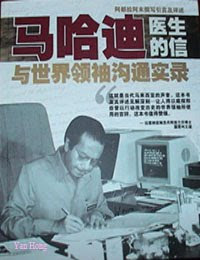 Now, he had become a popular blogger after retiring as the fourth Prime Minister of Malaysia. Is Tun Dr Mahathir Mohamad good in writing article? Well, after reading this newly published book "Dr. Mahathir's Selected Letters To World Leaders" then you will know the answer. The articles which indexed in this book were the correspondence between him with a couple of super celebrities in the world. These letters covering terrorism, globalization, war and conflict, economic and diplomatic relations. The super celebrities who corresponded with Tun Dr. Mahathir Mohamad including President Bill Clinton, President George Bush, President Jacques Chirac, Prime Minister Margaret Thatcher, Prime Minister Tony Blair, Prince Charles and Prime Minister John Major.